American Range ovens are inspired a passion for perfection, renowned for our product innovation and quality. Shop our collection of American Range gas and electric wall ovens. 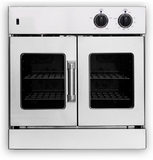 American Range offers both standard wall ovens and french door wall ovens.